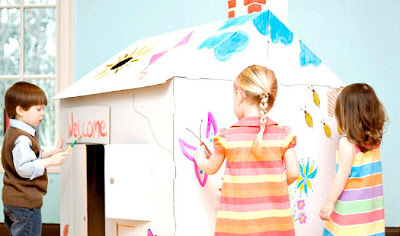 $13 for $40 Worth of Creative Playhouses! Can Get 2 or More Items for $13! Right now at Plum District, you can get $40 to spend on creative, cardboard playhouses for as low as $13! I checked out the prices and you could get 2 smaller playhouses for $40. Or, you could use your credit towards more expensive items, none of which are over $49.95. Shipping is an additional $6-$8. These playhouses are sturdy enough for weeks of fun, imaginative play and are totally eco-friendly! Again, click here to get a $5 credit, then click here to be brought to the deal, then use code fabulous to save 10%!